Home Have a Cuppa My book has arrived! 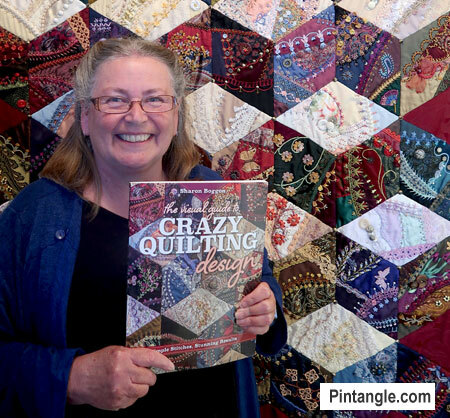 I received a copy of my book The Visual Guide to Crazy Quilting Design I am as chuffed as can be – wandering around the house with big silly grin. I am so pleased with it, as C&T Publishing have done a wonderful job. They did not squeeze the illustrations so there is a lot of eye candy, descriptions on how I did something, what I used etc and hopefully loads of inspiration. I hope it makes peoples fingers itch to stitch. 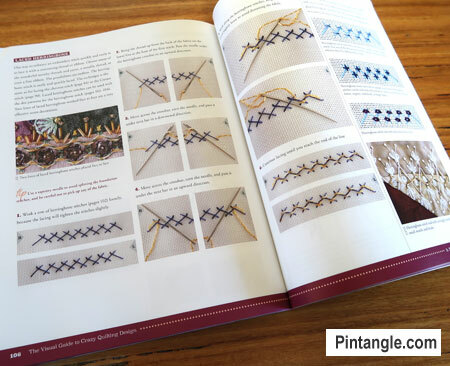 Also many people will be pleased to hear that there are right and left hand stitch instructions. There is a very big sense of achievement as I hold it. I am totally thrilled to see it – and am very happy with the result. 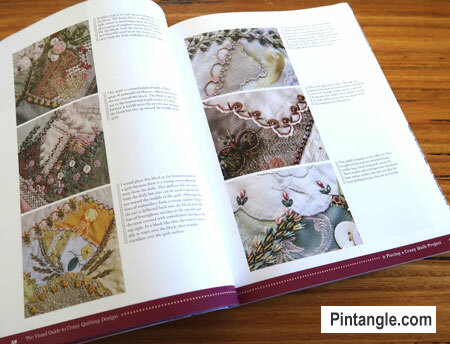 My book The Visual Guide to Crazy Quilting Design: Simple Stitches, Stunning Results is available on pre-order. It will be released early August. It’s on my wish list maybe I’ll get it for my BD. Well done! Thanks for all the amazing stitchery you share with us. Preordered! How could I not! Wow‼ Congrats Sharon It really looks nice. Now I also want a copy yeah. Many many congrats Sharon. I can’t tell you how happy I am for you. I have a copy on pre-order and can’t wait for it to arrive. I finally got around to ordering a copy of your book today. I was absolutely thrilled to pull it up on Amazon and see it listed as the #1 New Release in Needlework. Congratulations!!! It will be here on Wednesday, and I can barely wait. So happy for you, Sharon. I hope it is a big success. You deserve it! I have had it on pre-order since February. Getting even more excited after looking at this post. Can’t wait until it is in the mail! Great news! I pre-ordered and look forward to seeing it live! Woo hoo! Very big congratulations Sharon!! I know exactly how you feel, particularly after all the hard work that’s involved in getting a book to press. Now I’m off to pre-order my copy!! It looks so beautiful! Any chance you’ll be selling autographed copies? Congratulations Sharon! Been a fan of yours for a long time and have looked forward to you writing a book…the day is Here! So excited for you. Congratulations on your new book. From what I can see, it looks great! I wish you much success with this endeavor. I can only imagine how exciting it would be to hold your OWN new book! Thank you so much Sharon for your long commitment to beautiful stitching and embellishing and especially for sharing your techniques and teaching. You shine and light up the people around you!! Congrats. Just preordered it in my favourite Dutch online shop, can’t wait to hold it in my hands! Hi Annet – so pleased to hear the European shops are stocking it! Congratulations!!! Mine is on pre-order too. Can’t wait! I can hardly wait to hold that book in my hands. It looks wonderful, and you should have a big grin. Congrats and very happy for You! You are a real artist and knowledge sharing person. Enjoy the result of your hard work. Have anxiously been awaiting your book ever since I pre-ordered it! Can’t wait for it to arrive! Congratulations! That is awesome! Congrats 🙂 I’m gonna tell my readers to go order it immediately. Congratulations. Have your book on preorder with Amazon. I already pre-ordered and am eagerly awaiting my copy. Congratulations Sharon, book looks wonderful, and yes, the all day grin comes with success. It looks wonderful! And very detailed with beautiful illustrations. I have it on pre-order so I don’t forget it. Congratulations, I know it will be a runaway best seller! You deserve it! Congratulations! Grin and dance around the house all you want to, you deserve to! Well done Sharon. Congratulations. I shall get it from Amazon in the U K. It looks beautiful. Absolutely Brilliant! Can’t wait to get a copy! I’m so thrilled and delighted for you, and glad that the publishers have done such a great job that you’re happy with. Will this be available from anyone else other than Amazon? The illustrations and layout look fabulous, Sharon. No wonder you have a grin on your face. No doubt that it will be a winner. My own face is grinning at your achievement. Congratulations! Sure going to order it. Congratulations again. Wonderful achievement. Keep smiling. A wonderful success, Sharon. And I love your photo. Congratulations can’t wait to hold it in my hands. Your ‘big silly grin’ made me smile, and the book looks wonderful and inspiring.